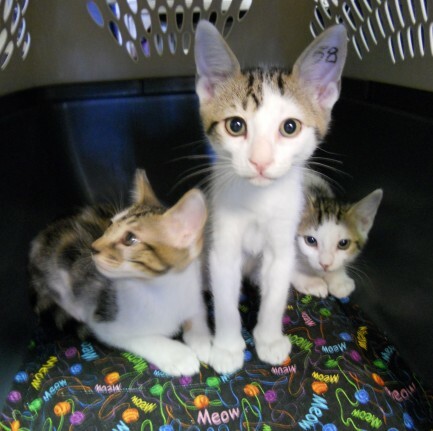 It is inevitable that you will find kittens while participating in Trap-Neuter-Return. What will you do with these kittens? Will you release them after surgery, or will you socialize them and adopt them out? It takes a lot of patience and total commitment to socialize feral kittens. The process can take 2 to 6 weeks, or even longer for older or more skittish kittens. Kittens under 10 weeks of age are ideal for socialization. Kittens over 12 weeks of age often take much longer to socialize, therefore it is not recommended unless you are working with a rescue group and can commit to spending months of daily effort on this process. Confine the kittens in a large dog cage, or in something that has plenty of room for a small litter box, food and water bowls, and an area for bedding. Keep them confined to the cage until they let you handle them without fear, then you can transfer them to a small room. You don’t want to let feral kittens run loose in a room where they can hide from you. Visit the cage frequently, every few hours if possible. Sit beside the cage and talk to the kittens. Don’t attempt to touch the kittens for the first 2 days. Let them get used to your voice and their surroundings first. Keep fresh water and dry food in the cage at all times, but give them wet food at least twice a day. Make them work for the wet food. Put it at the front of the open cage so that the kittens have to approach you to get it. Use a spoon with wet food to lure kittens towards you. After the kittens have relaxed for a few days, you can now attempt to handle them. Reach in the cage slowly using a towel to pick up kittens. Carefully wrap them up with the towel and hold them in your lap. Softly pet and talk to them. The more you interact with them, the faster they will socialize. Kittens can and will bite if they feel threatened, so be cautious and always use a towel. For more information on socializing feral kittens, visit Socializing Feral Kittens on Alley Cat Allies.